Whether our expert team are helping to design a warm and cosy family home or add value to a commercial property, they strive for perfection with each and every detail. And when we’re working with prominent architects, the desire to impress is magnified. That’s why this 2017 project is one of our all time favourites showcasing sliding doors. We’ve spent years honing our exceptional customer service and design expertise, as well as building relationships with premium brands. This often means clients discover us through past projects, which was the case here. This particular client was super-excited by builds that featured our signature Ultraline range. Being an architect, he was blown away by the effortlessly frameless look we were able to achieve on a variety of properties and knew we were the right team for him. It’s always creatively fulfilling to work with an architect with a clear idea and we developed a rapport with this client instantly. Because of this we were able to sharehis vision, recommending perfect products for each aspect of the brief. Most importantly, the client wanted the ground floor of his property to appear completely frameless and have all moving corners. 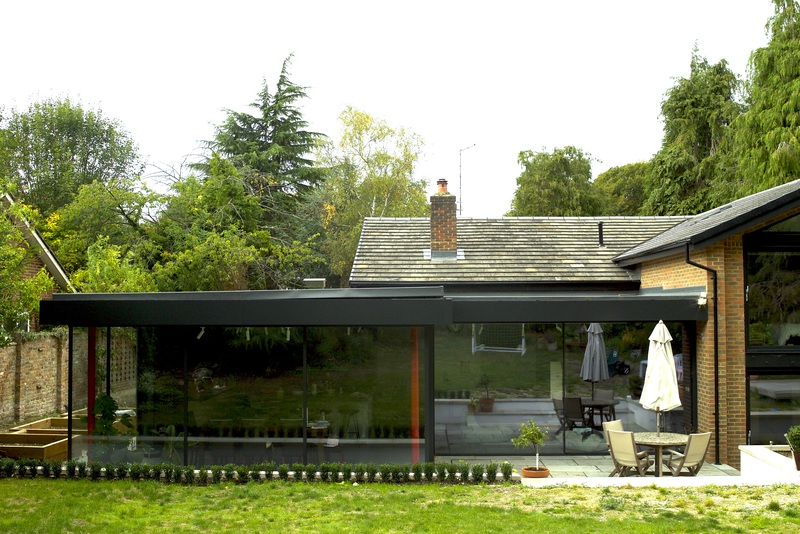 With its unique 20mm sightlines Ultraline Sliding Doors is the most minimal glazing system in existence and really is the only product innovative enough for the job. Our project consultant James also highlighted the hidden electric bolt locks at the top of the Ultraline frame as a benefit to the customer. This would cut down hugely on the frame size, enabling maximum sightlines throughout the property. A great example of how the little details can really enhance the end result. Our installation manager Dave took control during the next stage, with surveyor Eddie visiting the property at each stage. This ensured each step went smoothly, with the Smart Alitherm 300 slimline casement windows in Aluminium, Smart Ecofutural front door with Igman panel and the Smart Visoglide Plus sliding doors all being installed promptly on the first floor to the clients delight. For this installation we also created custom made aluminium pressings to cover the steelwork and tied it all in with our frames. Doing this really enhanced the aesthetic of the property and made for a beautiful finish. The client was exceptionally pleased with the end result, singling out the aesthetic of the slimline Ultraline Sliding Doors as a particular highlight. The client was also happy with the way the Smart Aluminium windows in RAL7021 matt complemented the timber cladding. With its all black aesthetic offsetting against red steel posts, this property truly is a striking triumph of architecture. Congratulations to James, Eddie, Dave, Iain, Kevin and Darren on a project well done!